A family known for their outreach in the Lowcountry is looking for the community’s support for their son who is battling multiple sclerosis at 38 years old. 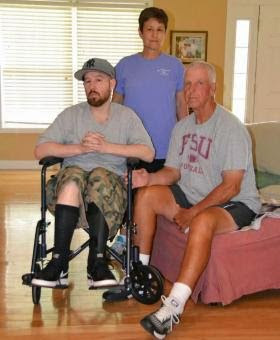 Josh Aragon, a Hilton Head Island High School graduate and son of Lindy and Leon Aragon, was diagnosed with the debilitating disease about 10 years ago. Lindy is a longtime local special education teacher and school psychologist and Leon, a teacher’s assistant at Red Cedar Elementary School, has volunteered countless hours as an assistant tennis coach at Bluffton High School. The couple is raising money to help pay for a new treatment that could halt the progression of their son’s disease and give him hope for the future. A high school baseball standout, Josh went on to pitch at Rutgers University in New Jersey while earning a degree in criminal justice. He also pursued his passion for music by DJ-ing at parties and eventually opened his own recording studio. Looking back, there were early signs that the disease was taking hold. In college, he realized he wasn’t doing as well on the baseball field. “Pitching is all about balance. My balance just started going bad,” he said. He also began feeling a tingling, numbing sensation in his left arm. “He just thought that he had finally hurt his arm, which happens a lot with pitchers,” Lindy said. Doctors performed MRIs and other tests, eventually determining there was nothing wrong with his arm. But one day in 2003, Josh woke up and knew something was very wrong. “I could see, but it was extreme double vision. I had to totally close my right eye and wear an eye patch to see,” he said. He was admitted to the hospital for a week and was given steroid treatment. Doctors diagnosed him with an infection and he was released from the hospital. “After I got out of the hospital, I kind of felt better. But then little things were happening,” he said. It wasn’t until about a year later that he was finally diagnosed with MS. Even after his diagnosis, Josh drove, worked, hung out with friends, exercised and ran his own recording studio in New Jersey. But when he came to visit his family in Bluffton during holidays, his parents saw the disease progress. It is believed that more than 2.3 million people are affected by MS worldwide, according to the National MS Society. But because the Centers for Disease Control and Prevention does not require physicians in the U.S. to report new cases, that is an estimate. Scientists aren’t sure what exactly causes MS, according to the society. Though there are FDA-approved medications that have been shown to slow the progression, there is currently no cure. Josh began taking a drug called Tysabri, which successfully prevented his immune system from attacking itself. But after doctors found he was at risk for a possible fatal brain infection that sometimes occurs in Tysabri patients, he stopped taking the drug and experienced an extreme relapse. As his symptoms progressed, Josh decided to move from New Jersey back to Bluffton in January 2014 to be closer to his family. Today, he lives semi-independently in a Bluffton neighborhood. His girlfriend, his brother Jesse and his parents visit him throughout the day to help with everyday tasks. Josh now has little control of his legs and uses a wheelchair for mobility. Living with the progression of the disease has not been easy for Josh or his family. “You watch them grow up and you take a deep breath and watch them become men. Then all of a sudden life throws you a curve and there’s not a whole lot anybody can do about it,” Leon said. A special education teacher in the area for 27 years, Lindy has worked with hundreds of families dealing with the challenges that come along with a special needs child. The couple agrees that the most difficult part has been the lack of control over the disease. “I would take all the disease in a heartbeat so my son could be healthy,” Leon said. It’s that same selfless attitude the couple has shown to others in the community for years, said Bob Brown, tennis coach at Bluffton High School, where Leon has volunteered for several years. “He puts in as many hours as I do and he’s not getting paid a nickel. They are just a generous and loving family. These are the kind of people that we should really try to help,” Brown said. About a month ago, Josh read an article about a treatment called hematopoietic stem cell therapy, which uses the patient’s own stem cells to reboot the immune system. The procedure has been successfully used to halt the progression and even reverse symptoms in other countries. However, because it is not approved in the U.S., it is being conducted in an unfunded clinical trial at Northwestern University. Josh’s insurance will not cover the procedure, which could cost in excess of $175,000 for the evaluation, procedure, travel and accommodations for 10 weeks.